"A huge success! This cheese ball featuring the sharp flavors of Gorgonzola and white wine is very popular with my Italian family. You can substitute chopped parsley or mixed herbs for the paprika." In a medium bowl, blend cream cheese, Gorgonzola cheese, sharp Cheddar cheese and white wine. Form the mixture into a ball shape. On a piece of wax paper, spread the paprika and pistachio nuts. 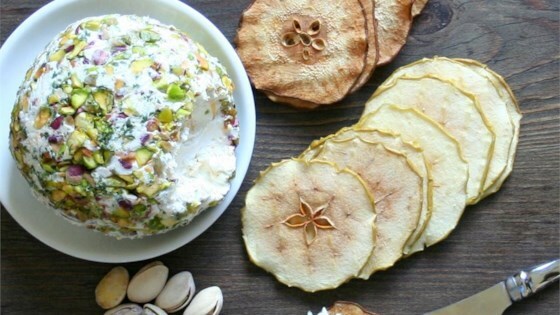 Roll the cheese ball in paprika and pistachios to coat. Wrap coated cheese ball in wax paper. Chill in the refrigerator 6 hours, or overnight, before serving. It was a big hit!! Half the people at the party requested the recipe. Not bad. Everyone seemed to like it, at our family christmas get together. I think next time, I will add more gongorzola cheese and a dash more wine. Rolled it in crushed almonds and pistachios. I changed it a bit - I added dried cranberries, pecans and a splash of lemon juice - I put it in a small crock and let it sit in the fridge for about 5 hours then served - it was delicious! I added twice the amount of bleu cheese to the recipe and it turned out fantastic. The presentation is very pretty and looks like a lot of time went into it. We enjoyed this very much. My company loved it!!! Perfect blend of cheeses. Will be making this one again! This is a super cheese ball. It has a definite Greek flavor to it. It's a bit different from your regular cheese balls. The wine adds a great touch.